Levy faces a tough challenge, since party leaders, including Erie County Chairman Nicholas A. Langworthy, say they do not want to support a candidate who in the past has supported the likes of Silver, former Gov. Eliot L. Spitzer and Obama. Langworthy is the chairman of the Erie County Republican Committee, which is the sole county committee to have endorsed Carl Paladino for Governor going into the convention. If ECGOP didn’t want to support someone who had previously supported Silver and Spitzer, (and while not Obama, he has given to Hillary Clinton), why did they support Carl Paladino? While Democratic Suffolk County Executive Steve Levy hunts around for the nomination of a party to which he doesn’t yet belong, he talks tough, touting his credentials over Rick Lazio’s. Clearly that party’s state designees, such as comptroller candidate Harry Wilson, Senate candidate Gary Berntsen, and AG candidate Daniel Donovan will be running against a caricature of President Obama, whose stimulus law has quite literally kept New York State – run for decades by idiot Democrats and idiot Republicans alike – afloat this past year. Finally, here’s a brief interview the Daily News’ Celeste Katz held with Buffalo’s own Carl Paladino. It seems a bit disingenuous for him to accuse others of being zebras trying to change their stripes, because “once a zebra, always a zebra” might apply to Mr. Paladino, as well. (Also, what’s with this talk of zebras?) 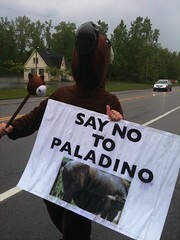 Paladino thinks he has a shot, and that’s just special.